1. In a large Dutch oven over high heat, bring corned beef with pickling spices and water to a boil. Reduce heat to low, cover, and simmer 2-1/2 hours, or until almost fork-tender. 2. 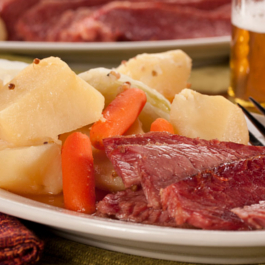 Add potatoes, carrots, and cabbage to corned beef and continue cooking, covered, 25 to 30 minutes, or until vegetables and corned beef are fork-tender. 3. Place corned beef on a cutting board and slice across the grain. Serve with vegetables. © 2018 Ginsburg Enterprises Incorporated. All rights reserved.